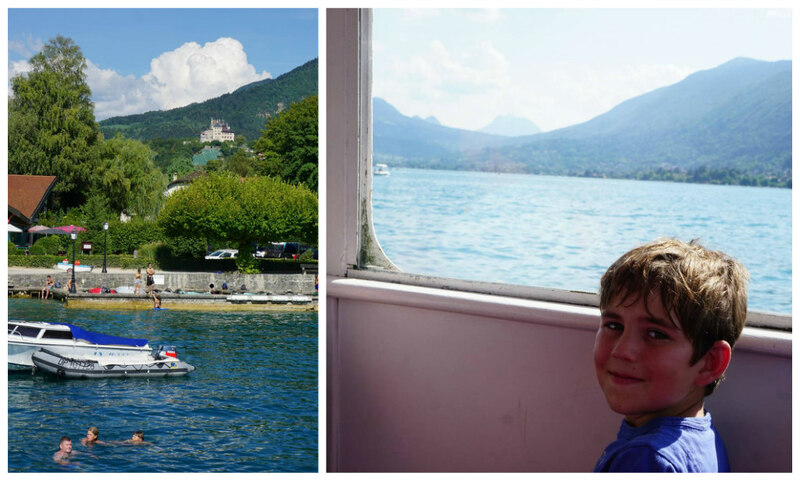 For the final week of our European roadtrip, we headed back to France and down to Lake Annecy. I’ve wanted to visit there for years, admiring the scenery on Le Tour de France coverage! And it really was as beautiful as the helicopter shots promised. We based ourselves in a campsite at the south of the lake for four nights (our final four under canvas – whooop!) – but more on that later. When we weren’t enjoying the campsite we packed in as much as we could. 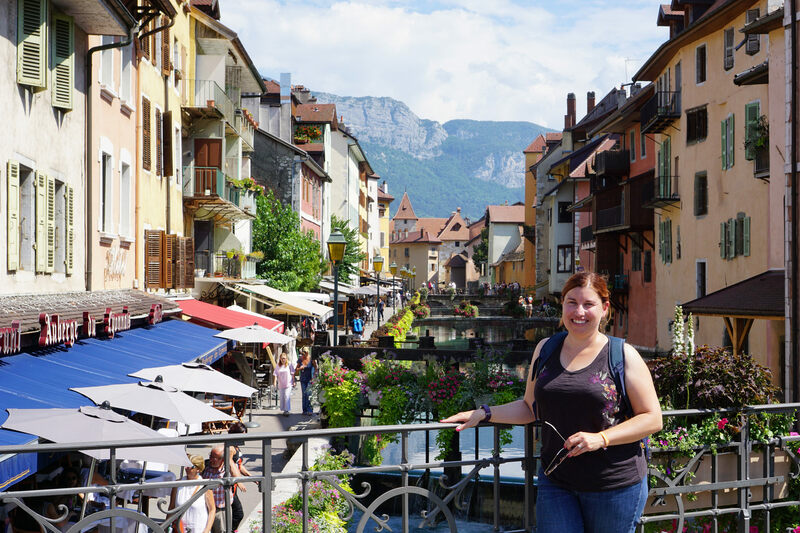 We spent our first day visiting the town of Annecy on the northern tip of the lake. I almost regretted the decision to go, as the lakeside traffic was pretty bad – but it was so worth the queues. The old town was absolutely stunning. The old town was so pretty, full of pastel houses, canals, bridges and cobbled streets – all set against the backdrop of mountains. We whiled away hours wandering around admiring the views. 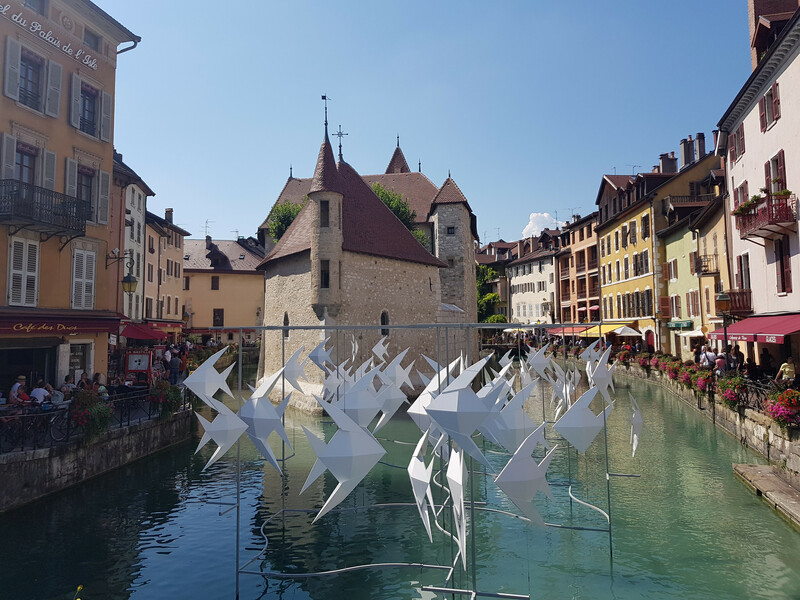 I loved the artwork installation in front of the beautiful Palais de l’Île – a medieval castle & prison. 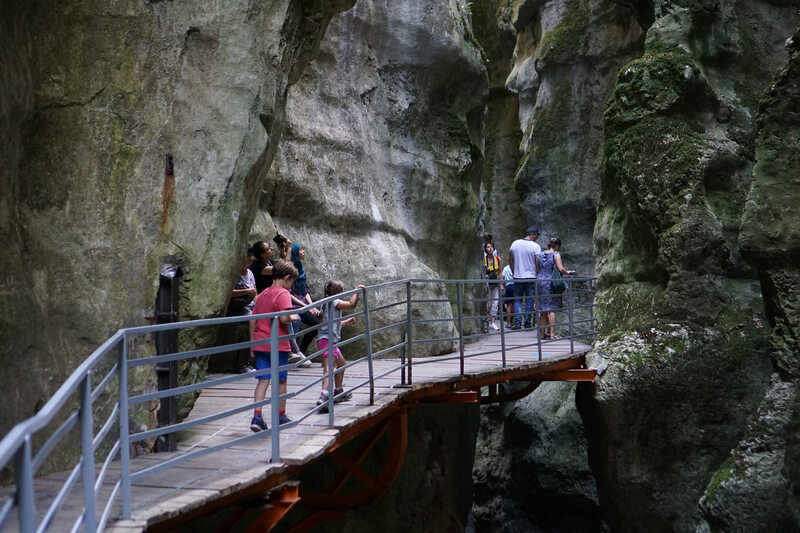 It was a great introduction to French cafe culture for the children – we enjoyed a completely delicious lunch in a restaurant on a cobbled alley (Alex discovered steak haché and could rarely be tempted to order anything else for the remainder of the holiday!) and ate enormous ice creams to take the edge of the sweltering heat. 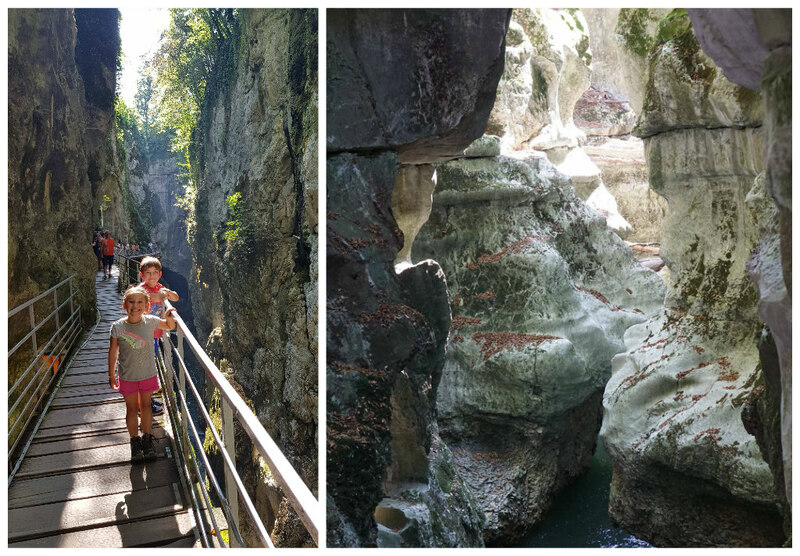 We drove back to our campsite via the spectacular Gorges du Fier, a narrow canyon with a walkway attached to the rocks, high above the river. 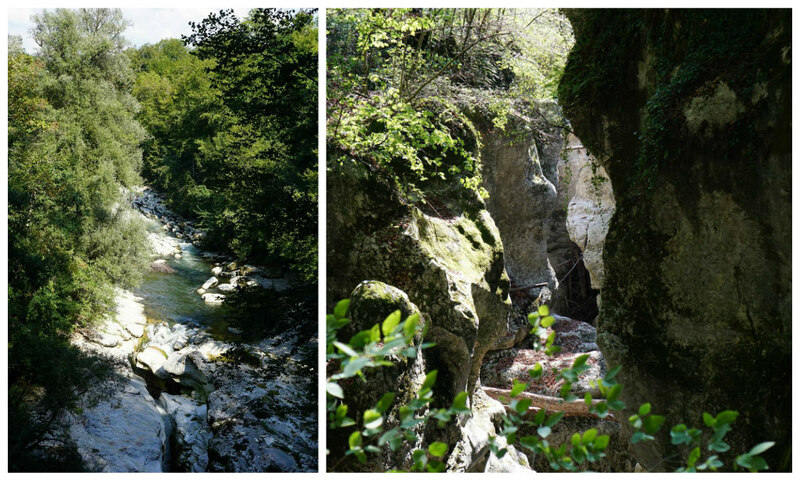 It was a beautiful drive through lush trees and fields to get there, and on the approach there was no hint of what we would find when we arrived. 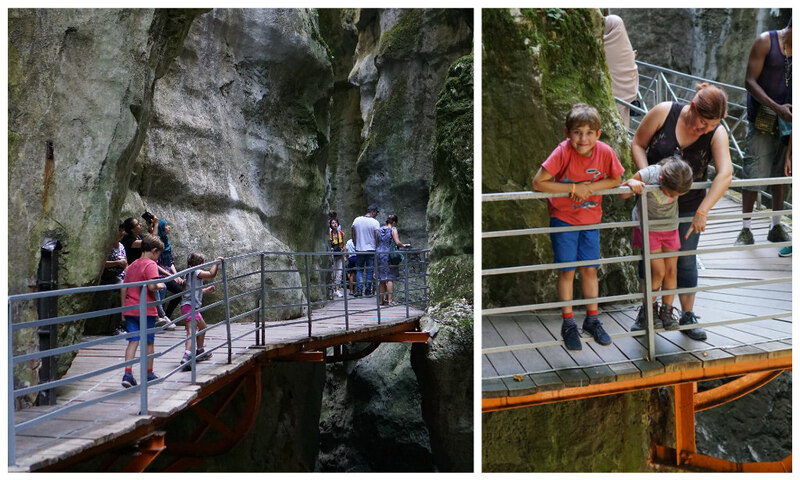 As we entered the gorge on the raised walkway, it was breathtaking. 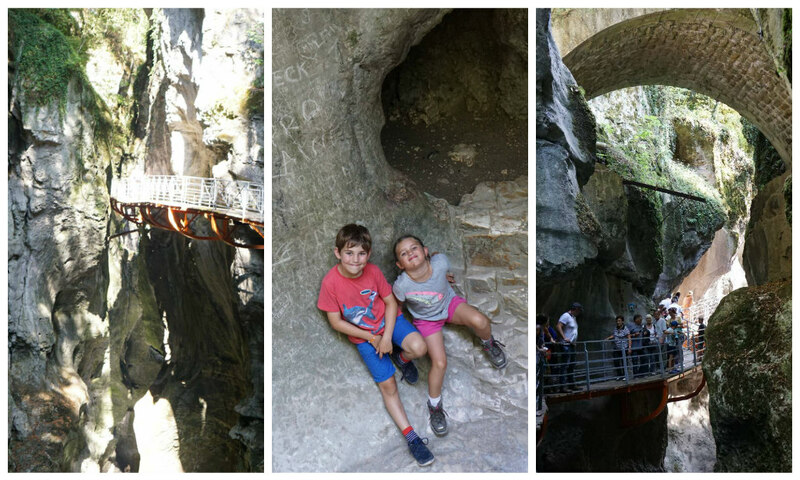 The children raced ahead, loving the drama of the imposing walls and looking for faces in the rocks. 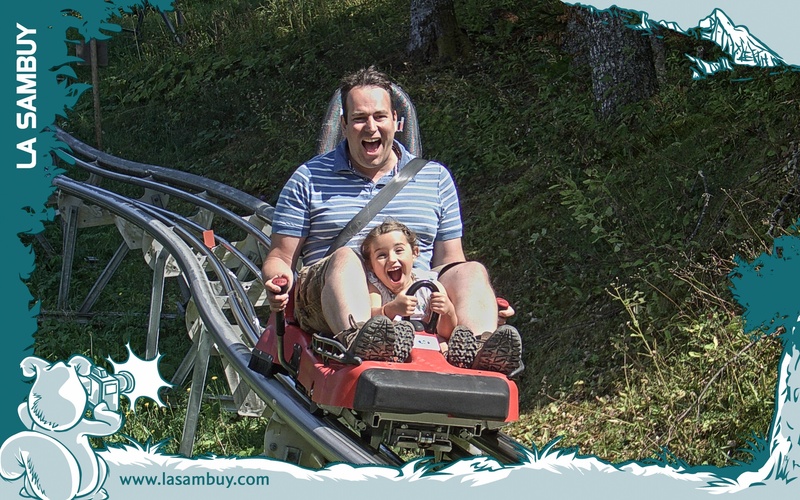 We wanted to see more of the mountains, so we spent our second day at La Sambuy – a winter ski resort which has a range of summer activities on offer for families. We were all excited to hop onto a ski lift to head up the mountain. I loved how quickly the noise of people, cars and activity died down and all you could hear was the wind and cow bells. As we climbed, the views expanded and we could see mountains all around us. 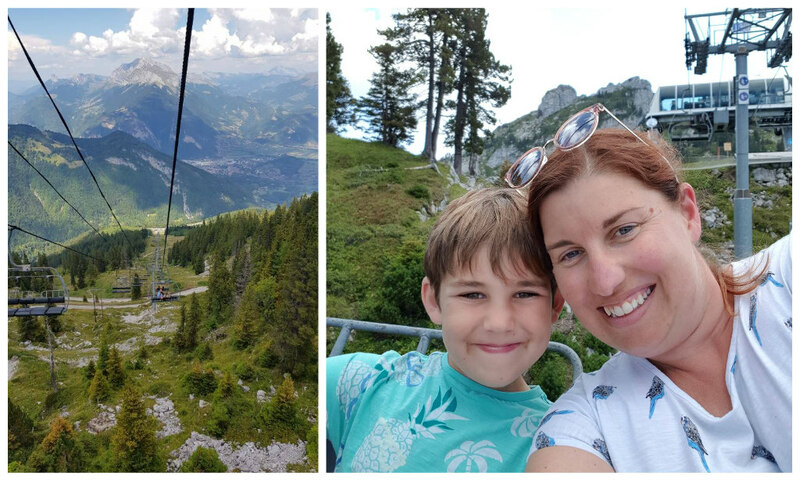 It took a surprisingly long time, but eventually we arrived at the mountaintop station and got through the slightly terrifying moment when you have to jump off the lift and run to the side without getting whacked in the bum! We thankfully all managed it, and were greeted by incredible views. 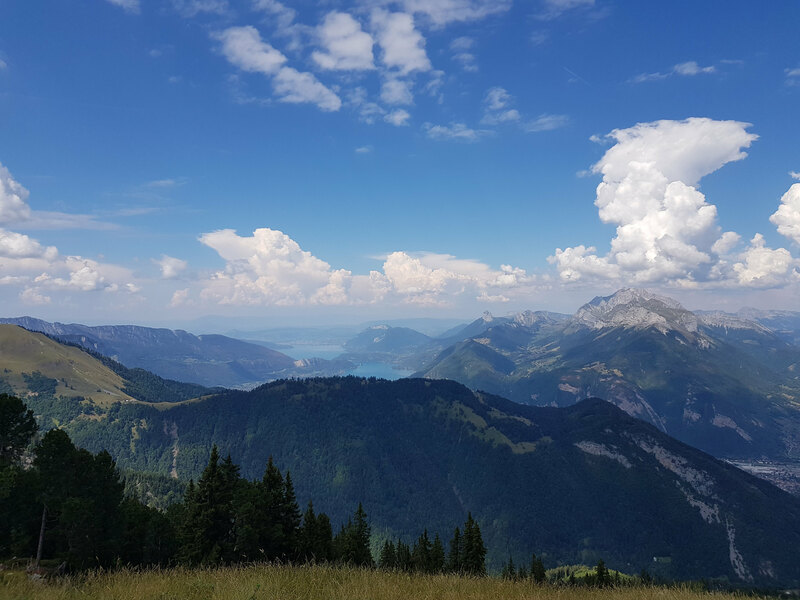 From the top, you could see back along Lake Annecy and also as far as Mont Blanc, the highest peak in the Alps and in Western Europe. We found a scenic spot and enjoyed a picnic together, before posing for photos against the view. Love this portrait of a selfie! 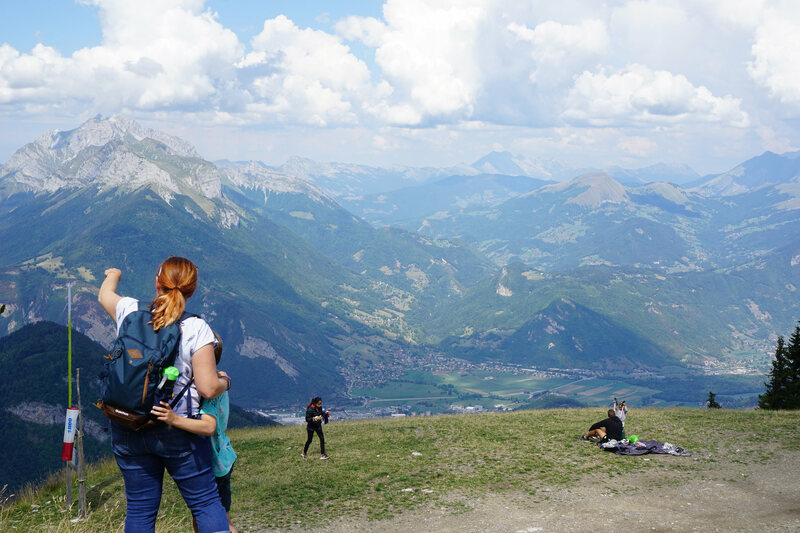 We all loved wandering around at the top, although sadly didn’t have enough time to trek up to the summit of the mountain. Alex had a moment of drama when he’d wandered off to explore a bit further and got surrounded by some huge shepherd’s dogs who were herding goats! My normally dog-confident son was a bit shaken up, but some nearby tourists shooed them away and he recovered quickly to enjoy some more adrenalin fun during the afternoon. 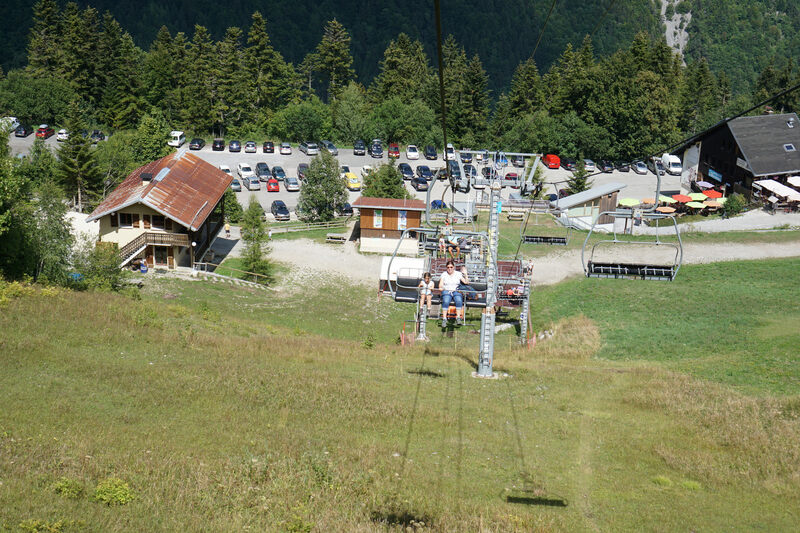 Back down the cable car, we found a series of summer activities including this crazy jump! Here’s Alex flying high! 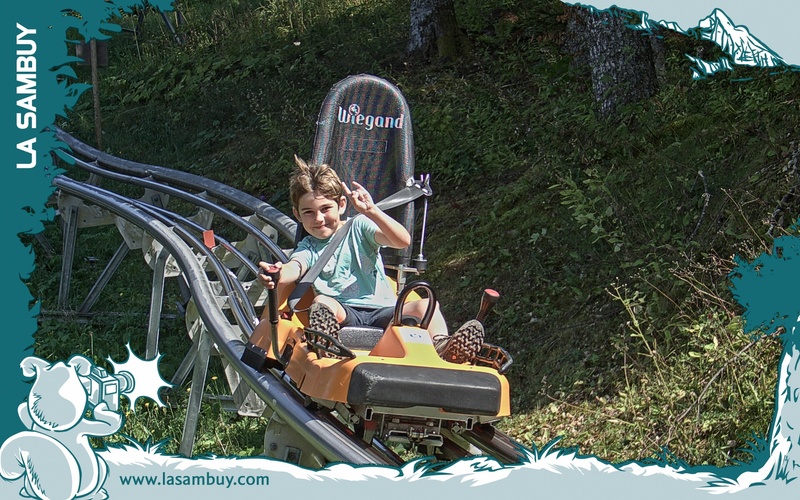 Best of all was the summer toboggan which my entire family adored! 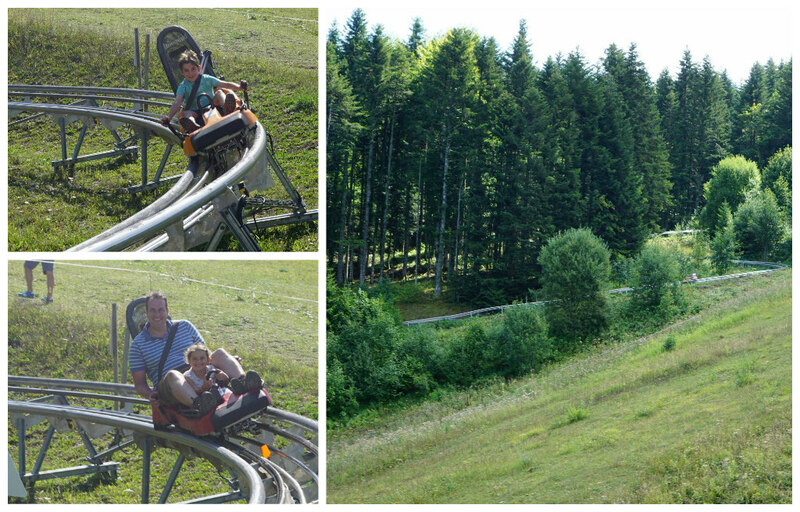 We’d seen it through the trees from the chairlift and couldn’t wait to give it a go. Sophie rode with Matt and Alex was big enough to go alone. We just had to buy the official photographs because they were so brilliant – look at Sophie’s face here! And super cool Alex, who I don’t think used his brake much at all! 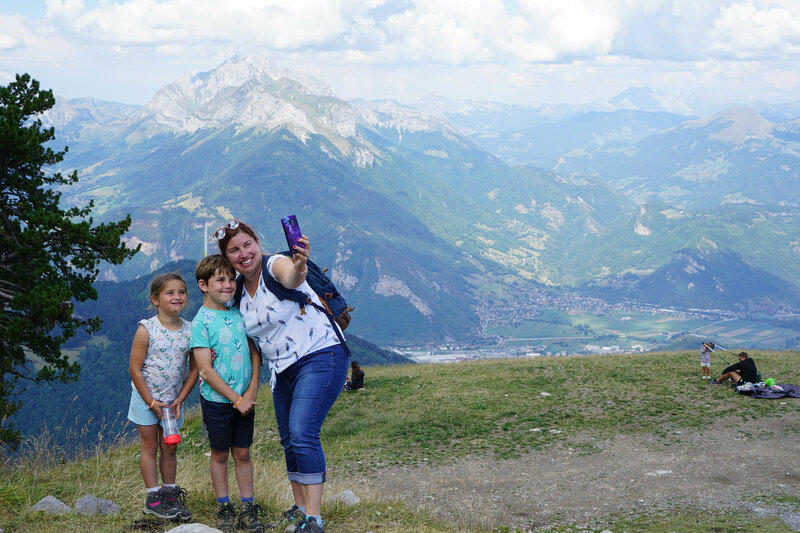 After a couple of goes on the toboggan, we drove to another scenic spot – the Col de la Forclaz. 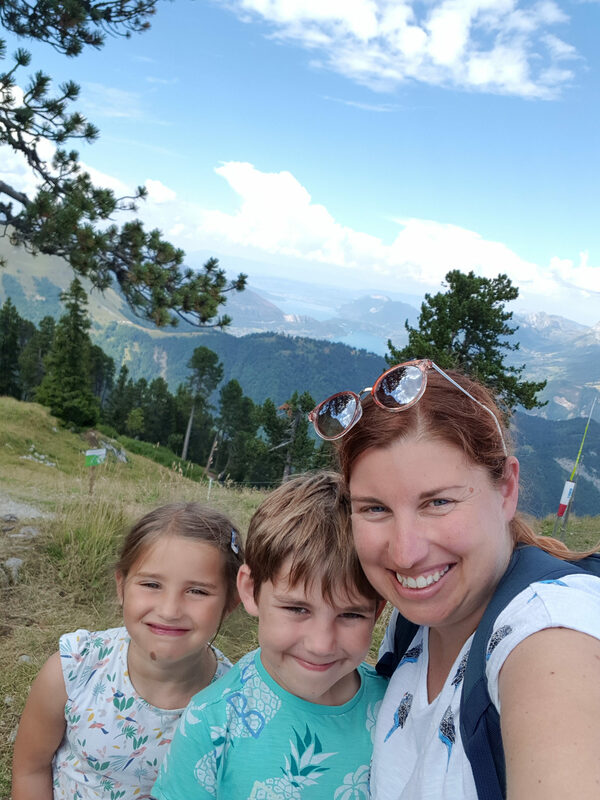 Famous for paragliders and cyclists, we lazily decided to drive up to the top – but not to throw ourselves off it! I cannot imagine being fit enough to make it up all the switch backs along the road! 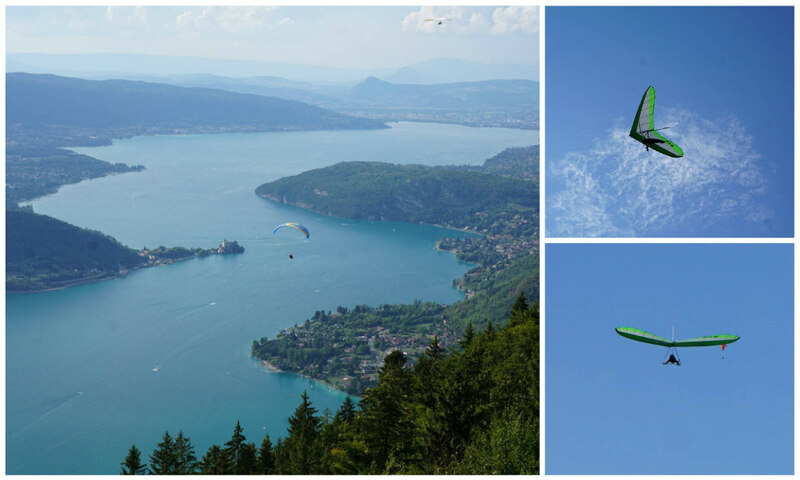 The views were incredible with all of Lake Annecy below you and the bright blue sky filled with paragliders. We spent ages watching them. Feeling a little inspired after seeing so many cyclists the day before, we opted to spend our final day on bikes along the lake. There’s a cycle path running for 50km along an old railway track, separated from the busy road traffic. 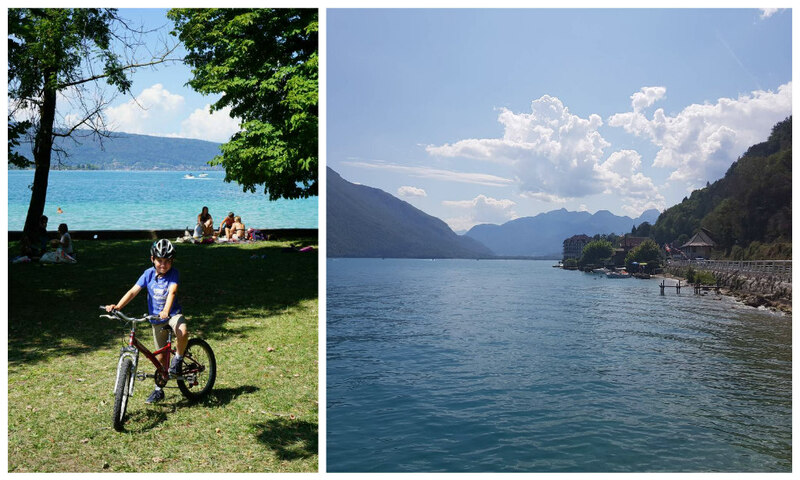 So we picked up hire bikes near our campsite and set off with a grand plan of cycling to Annecy and getting the boat back that afternoon! It quickly became apparent that we’d been a little too ambitious for Sophie! Although a really confident cyclist at home and used to fairly lengthy rides, she didn’t like the bike we’d hired for her, and wobbled along at an extremely slow pace! It got really stressful with her not maintaining a straight line as faster cyclists, other families and skateboarders whizzed past her! We managed 5km with her, stopping for an early picnic lunch at a gorgeous park right on the water in the village of Duingt. What a picnic spot! 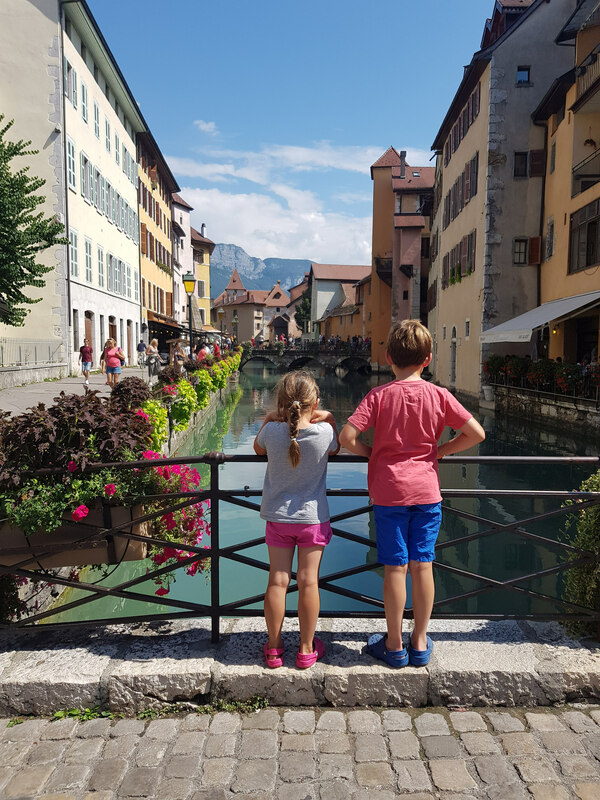 Checking out the Annecy boat times, we found that the next lake ferry wasn’t due to stop for hours. So we decided that Sophie and I would head back while Alex and Matt would press on. 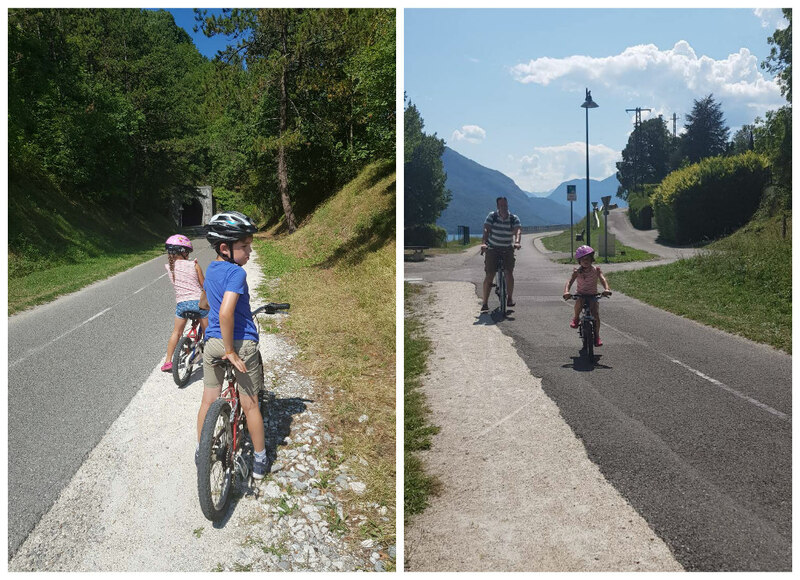 Alex and Matt were able to cycle at a much quicker pace, and made it all the way to Annecy, cycling nearly 20km in total! They passed beautiful beaches, villages and harbours along the way (sadly taking no photographs!). 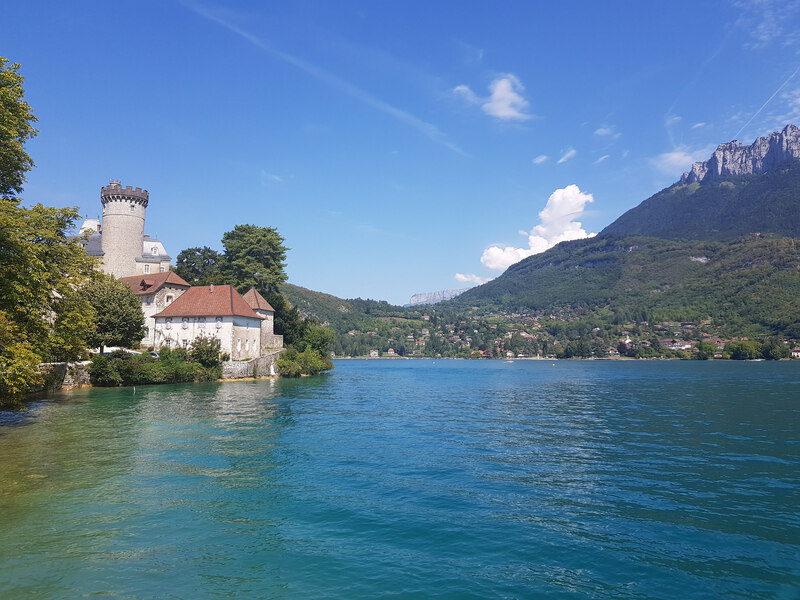 They revisited the ice cream shop for cones and smoothies, making it to the main Annecy harbour just in time to catch the slow ferry all the way back to the southern tip of the lake! 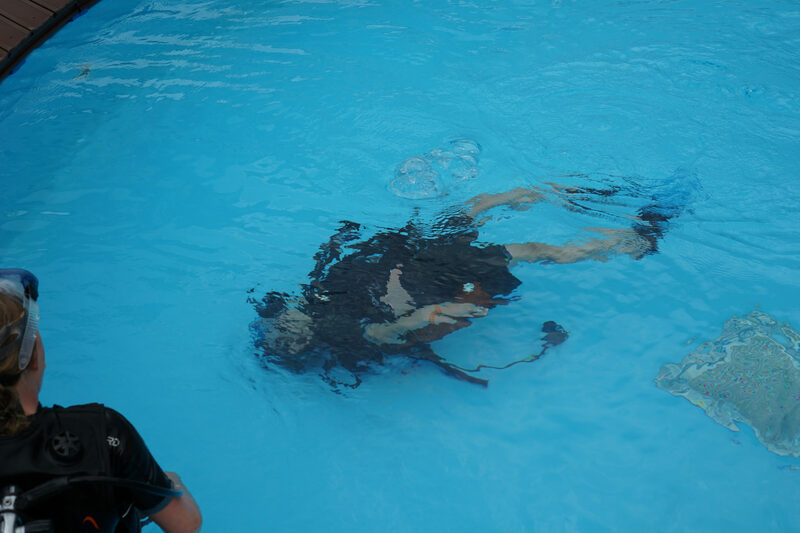 Alex was exhausted, but I think proud of his achievement! Meanwhile, Sophie and I slowly cycled back to the hire shop to return the bikes and then walked down to the lakeside for some swimming! 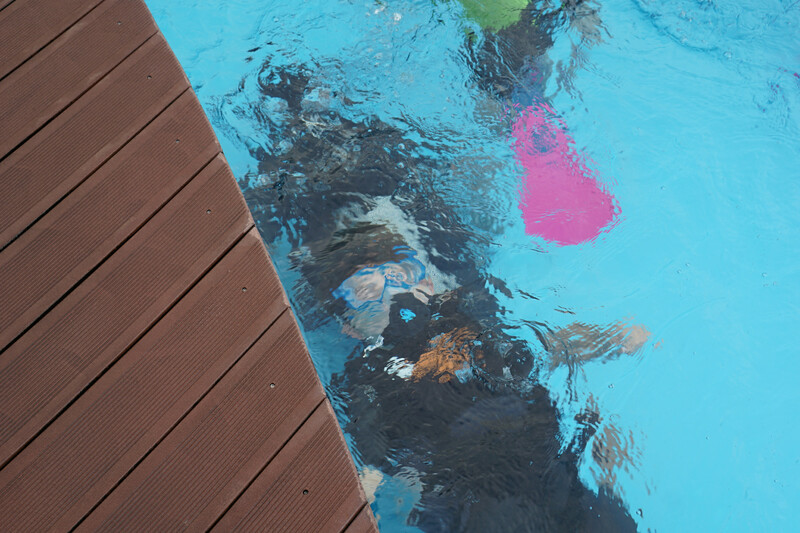 I’m so glad we did as it was our only opportunity to actually swim in the lake. Sophie adored it – it was so warm. One of the reasons we didn’t end up swimming in the lake and hanging out at the beaches was because our campsite was so good! 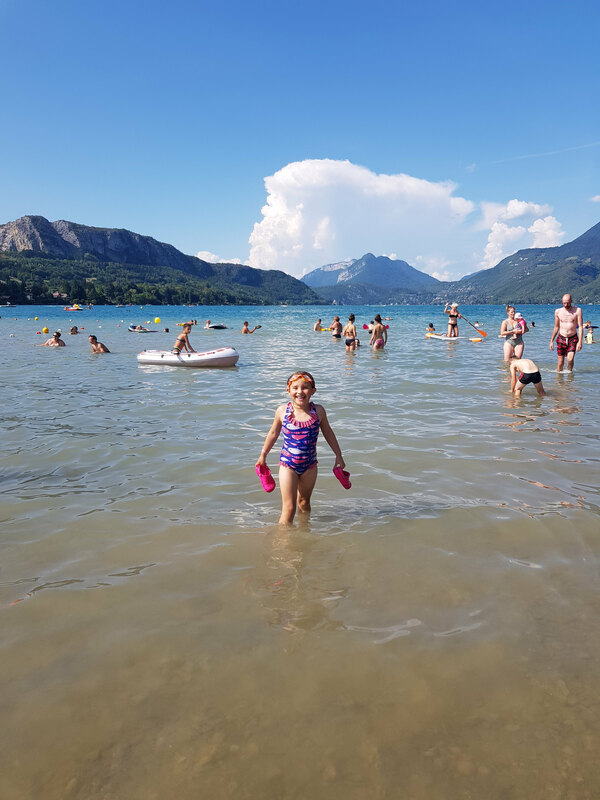 We’d booked into Camping Les Fontaines, near the southern shore of the lake. 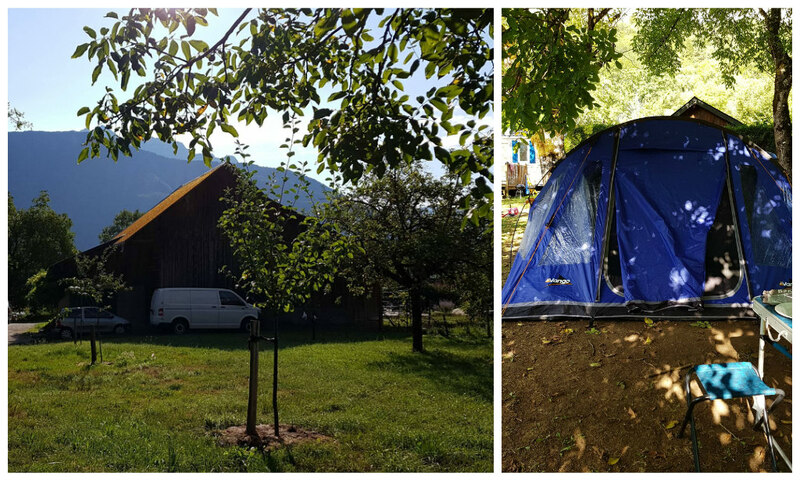 As with our first campsite, much of the site was used by companies like Europcamp with small cabins and caravans, so we were given a spacious, peaceful pitch shaded by chestnut trees with beautiful views. 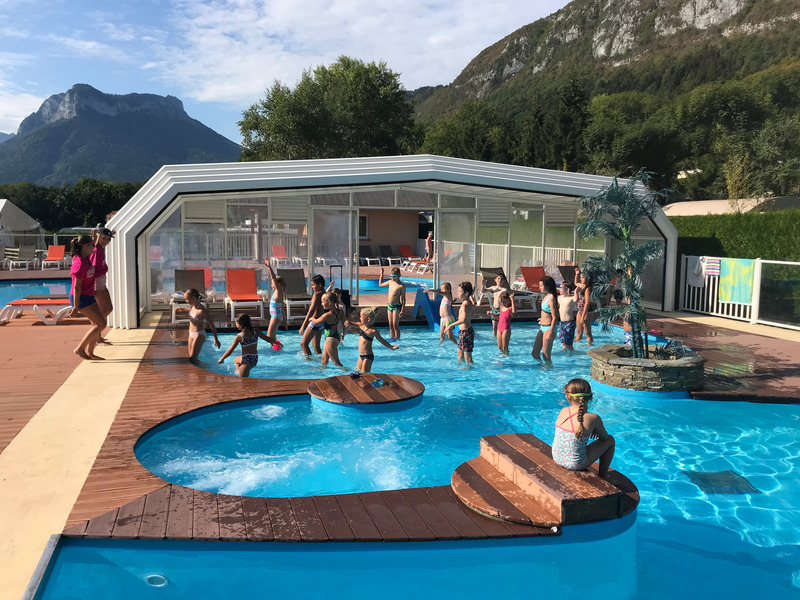 The campsite facilities were excellent, with a gorgeous swimming pool with lazy river and a separate slide pool (where the children spent hours each morning!). 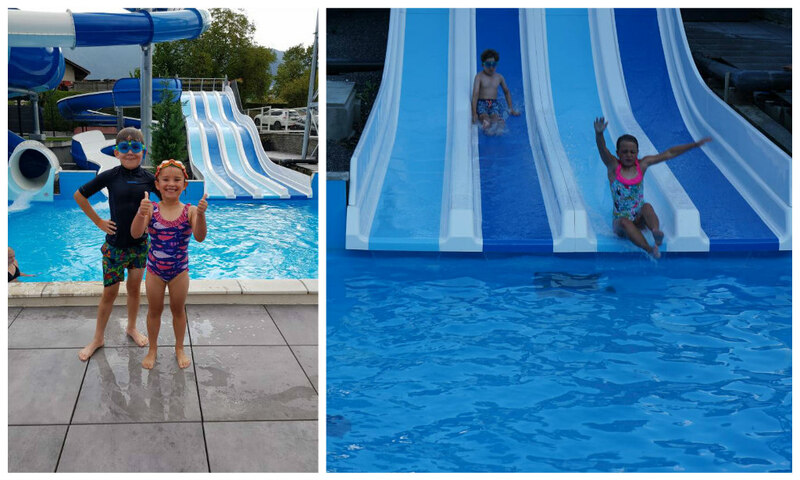 The picture bottom right here is during the waterslide competition the campsite ran – Alex, on the left here, isn’t doing very well! 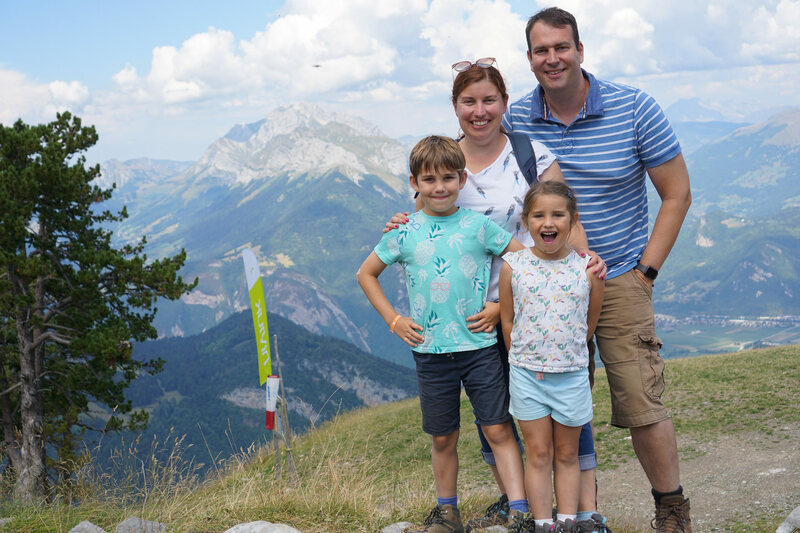 We ended up eating at the campsite restaurant on most evenings as the food was excellent (fondue, tartiflette – as well as steak hache of course!). And often after evening there were kids activities, including an amazing fireworks show. 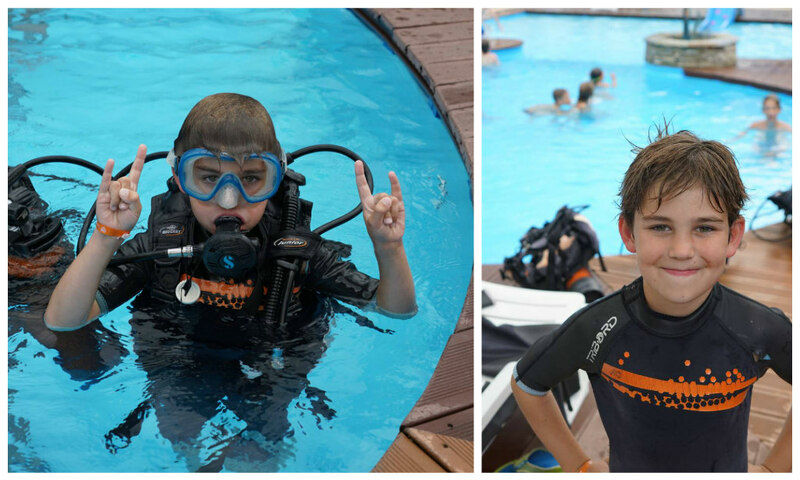 Best of all – and the highlight of Alex’s holiday – was the opportunity to try scuba diving in the pool! 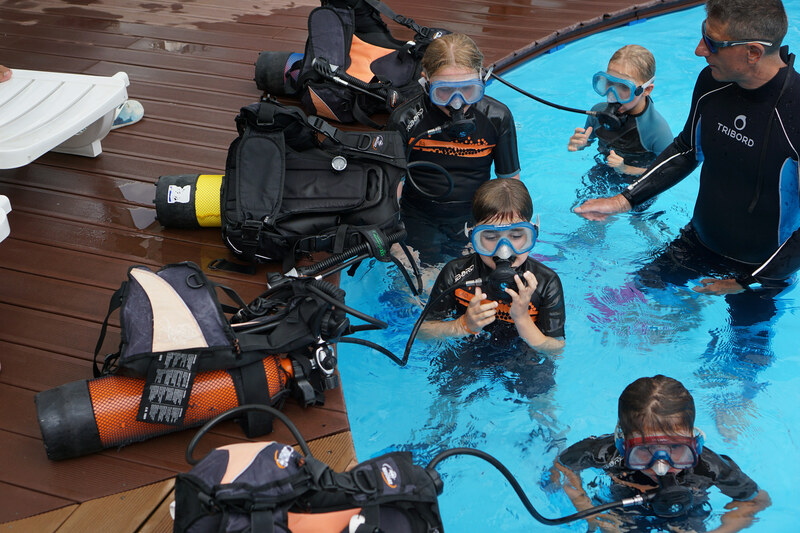 The campsite brought in an amazing instructor who took a group of children for an hour and had them all diving by the end of it! 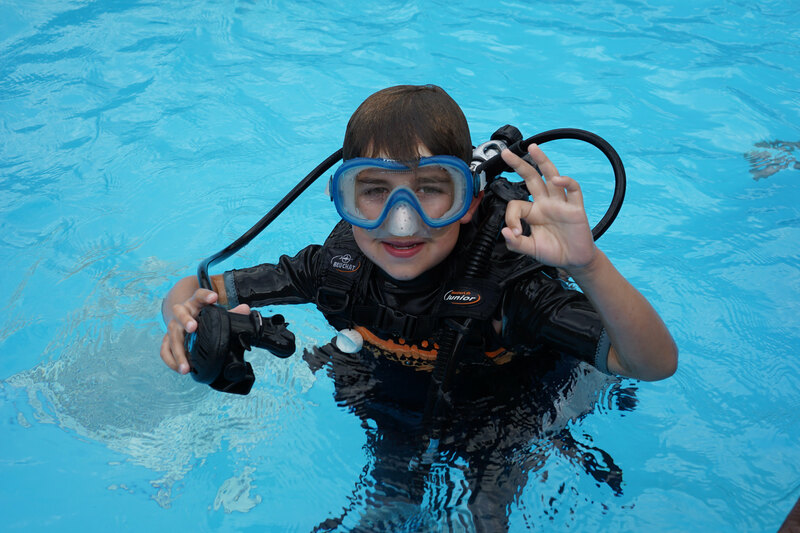 Alex absolutely adored it – and given Matt and I met scuba diving, it was incredible watching our son discover how much fun it is! Sophie was itching to have a go, but she needs to wait a couple more years! 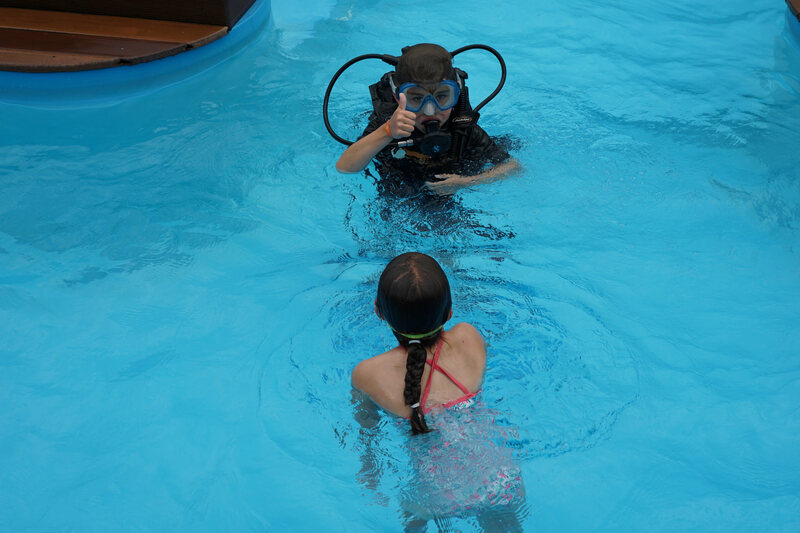 Instead, she enjoyed swimming around under water after her big brother! Look at his proud face! Such a wonderful experience. 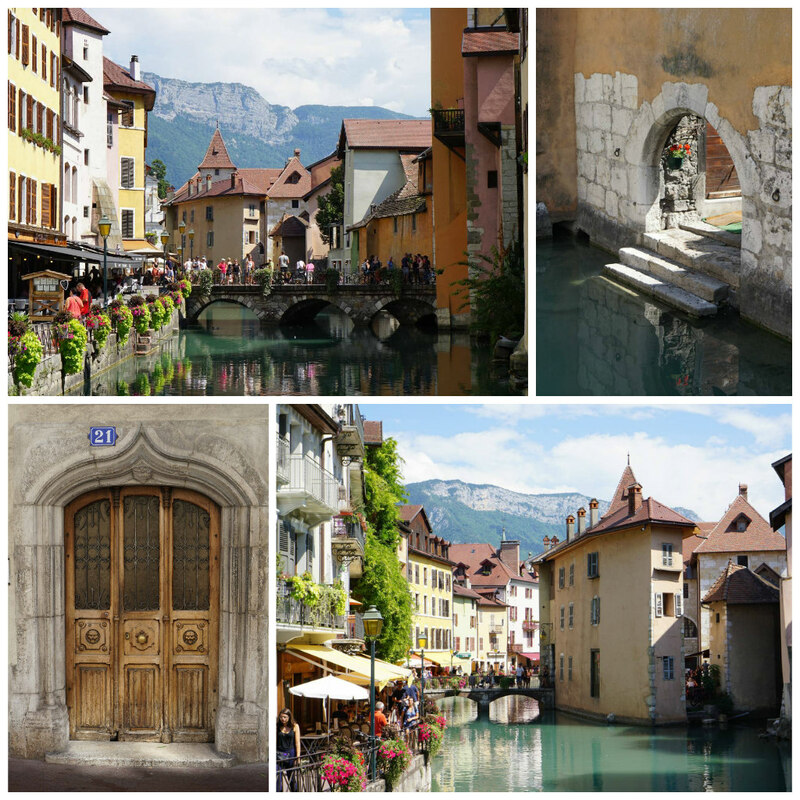 A lovely photo with some stunning photos bring back memories of my visit to Annecy a long time ago.